The Pentecostal teaching that a believer can LOSE salvation has been a cause for great concern by believers for a long time. From my own experience, I have found that the average Christian isn't sure what to think about the Pentecostals (i.e., the Charismatic Movement). Are they saved or not? If you speak to most Charismatics, they'll give every impression that they're true Christians. Many are aggressive witnesses for their religion. Yet something is VERY wrong with their doctrine ... VERY WRONG! The Jehovah's Witnesses are as aggressive as any religion in propagating their doctrines; yet they serve Satan by spreading devilish doctrines. Just because Pentecostals are aggressive to spread their doctrines doesn't mean that they're of God. Charismatics PERVERT the Gospel of Jesus Christ by ADDING holy living as a requirement to keep one's salvation. This is utter self-righteousness, and a lack of faith in God. The two largest Pentecostal bodies in The U.S. are Assemblies of God (2.5 Million) and Churches of God in Christ (5.5 million). Churches of God in Christ is the largest Pentecostal body in United States according to Denominations Comparison (Rose Publishing, 2003). The Church of God, which is more prominent in the South, had a membership of over 1,000,000 in 2002. Men did not initiate this gift, God did! You can't show me one place in the Bible where a Christian decided to speak in tongues. Rather, it was always initiated by God at spontaneous times of God's choosing. The gift was for the purpose of soulwinning. Thousands of people were saved at Pentecost (Acts 2:41). The ridiculous practice of speaking in the Charismatic's mumbo-jumbo "tongues" is of the Devil. They've created a form of entertainment that attracts carnally-minded people. Proof of this is in the Bible itself. Do you realize that the ONLY church in the New Testament to which Paul ever wrote to speak about tongues was the church at Corinth ... THE CARNAL CHURCH! Paul stated in 1st Corinthians 3:1-3, "And I, brethren, could not speak unto you as unto spiritual, but as unto carnal, even as unto babes in Christ. I have fed you with milk, and not with meat: for hitherto ye were not able to bear it, neither yet now are ye able. 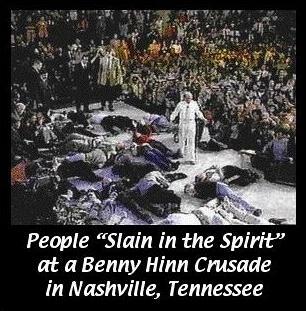 For ye are yet carnal..." Pentecostals meet in their religious buildings and act like crazy idiots--falling on the floor, barking, howling, babbling, etc. This is carnal, and not in any way related to the gift of tongues at Pentecost which was used to relay the Gospel to lost sinners. When Abraham was old, he sent his eldest servant, Eleazar, back to his native land to find a Christian wife for Isaac. Eleazar took with him, as gifts, many expensive items and ten camels, and set out for Mesopotamia. Notice that the PURPOSE of the the "gifts" was to bring back a BRIDE for Isaac. If Eleazar would have come back without the bride, he would have failed. This is a good illustration of how foolish Charismatics are today. Pentecostals make the gifts an END in themselves. Do you think Abraham would have been pleased if Eleazar gave all the gifts away, but came back WITHOUT the bride? Abraham would have been very angry. This is what the Charismatics are doing today. Instead of focusing on the main issue, which is SOULWINNING; they have focused on the gifts. Peter knew what he was trying to say. Pentecostals openly admit that they don't know what they're saying when they speak in tongues. Thus, Charismatic "tongues" is demonic. There is absolutely NOTHING in the Word of God about speaking in some "unknown" language. Acts 2:6 plainly states ... "every man heard them speak in his own language." The Biblical evidence against the Charismatic Movement is solid, and damning. Great Soulwinning Preachers Never Spoke In Tongues! If speaking in tongues is the initial evidence of being filled with God's Spirit, then why didn't Charles Haddon Spurgeon, London's greatest preacher, ever speak in tongues? Why didn't the legendary Dwight L. Moody speak in Tongues? Why didn't Evangelist John R. Rice, Pastor Jack Hyles, or Dr. Lee Roberson ever speak in Tongues? Why didn't the mighty preacher George Whitefield speak in tongues? Why didn't Pastor F.B. Meyer's speak in tongues? Why didn't the powerful evangelist Billy Sunday ever speak in tongues? Don't you see what a bunch of liars and false prophets the Charismatics are? The true Biblical evidence of being filled with the Holy Spirit is a desire to go soulwinning ... John 15:5 states, "I am the vine, ye are the branches: He that abideth in me, and I in him, the same bringeth forth much fruit: for without me ye can do nothing." Any carnal fool can utter some jibber-jabber out of his mouth (what the Pentecostals call "tongues"). The desire to win lost sinners to Jesus Christ is the strongest evidence that someone is filled with God's Spirit. Why do Charismatics focus solely upon the tongues at Pentecost? The big story folks was that at least 3,000 lost sinners were saved that day!!! 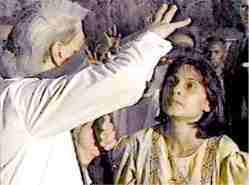 Photo to Left: False prophet Benny Hinn doing his hocus-pocus act. Carefully notice that no one in the Old Testament spoke in tongues. In Acts chapter 9 we read of Saul's conversion (later to be called, Paul, the Apostle). There is no mention of him speaking in tongues as an initial evidence of salvation. A Samaritan woman (the woman at the well) was saved in John chapter 4; but we don't see any Biblical record of her speaking in tongues. There is no record of Jesus speaking in tongues. Paul never mentioned speaking in tongues in his epistles to the churches, except to the carnal church of Corinth. The Apostle John wrote 1st John so we could KNOW we are saved (1st John 5:13); yet he never mentions speaking in tongues. The book of Revelation never mentions speaking in tongues. Clearly, Pentecostals have created a false religion. "Without question, some believers who do not speak in tongues have accomplished great things for God." How can this be? How could the greatest soulwinning preachers throughout history have accomplished great things for God without being spirit-filled? Zechariah 4:6 is clear, "...Not by might, nor by power, but by my spirit, saith the LORD of hosts." The two statements made by the Assemblies of God above CONTRADICT each other. In one statement they say "speaking in tongues is the unmistakable initial evidence of the baptism of the Holy Spirit"; but then they admit that great things have been done for God by believers who didn't speak in tongues. That doesn't make any sense. If speaking in tongues is "unmistakable evidence" of being Spirit-filled, then the mightiest preachers should have all spoken in tongues; But they DIDN'T. Dwight L. Moody is responsible for the salvation of millions of lost sinners; yet he NEVER spoke in tongues even once. Clearly, Charismatics are a wayward bunch. Why is it that Charismatics are the ONLY ones practicing "dancing in the spirit" or "being slain in the spirit?" Notice that I used a small "s" deliberately, because what Charismatics are practicing is demonic. Pentecostals are the only religious group who require speaking in tongues as evidence of salvation. Such teachings are not only heretical, but equally ridiculous as well. "And Ananias went his way, and entered into the house; and putting his hands on him said, Brother Saul, the Lord, even Jesus, that appeared unto thee in the way as thou camest, hath sent me, that thou mightest receive thy sight, and be filled with the Holy Ghost. And immediately there fell from his eyes as it had been scales: and he received sight forthwith, and arose, and was baptized. And when he had received meat, he was strengthened. Then was Saul certain days with the disciples which were at Damascus. And straightway he preached Christ in the synagogues, that he is the Son of God." The first thing that Paul did after he got saved was SOULWINNING! When Paul was filled with the Holy Ghost, he went SOULWINNING! There is NO mention of tongues anywhere surrounding Paul's conversion experience.